(2014). Structural and Optical Properties of Gold Nanoparticles Formed by Wet-Chemical Method. International Journal of Bio-Inorganic Hybrid Nanomaterials, 3(1), 17-21.
. "Structural and Optical Properties of Gold Nanoparticles Formed by Wet-Chemical Method". 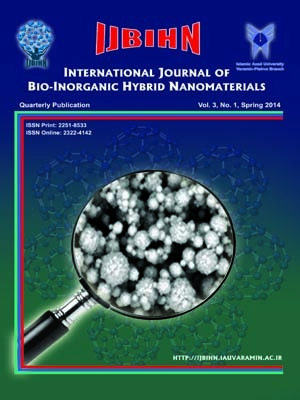 International Journal of Bio-Inorganic Hybrid Nanomaterials, 3, 1, 2014, 17-21. (2014). 'Structural and Optical Properties of Gold Nanoparticles Formed by Wet-Chemical Method', International Journal of Bio-Inorganic Hybrid Nanomaterials, 3(1), pp. 17-21. Structural and Optical Properties of Gold Nanoparticles Formed by Wet-Chemical Method. International Journal of Bio-Inorganic Hybrid Nanomaterials, 2014; 3(1): 17-21. Our aim in this work is the synthesis and study optical and structural properties of gold nanoparticles.Gold (III) chloride trihydratewas taken as metal precursor, ascorbic acid at the presence of an appropriate amount of NaOH as reducing agent and polyvinylpyrrolidonek-30 (PVP K-30) as a stabilizing and capping agent. The reaction was performed in high-speed stirring rate at room temperature.Scanning electron microscopy (SEM with EDAX), X-ray diffraction (XRD) and DRS UV-Vis analysis have been used for characterization of the sample. SEM images shows formation of spherical shape nanoparticles. X-ray diffraction (XRD) measurements showed that the nanoparticles are crystalline and mainly composed of face-centered cubic (FCC). Using the Debye-Scherer formula average particle size of nanoparticles was calculated to be about 4.28 nm. UV-Vis absorption spectrum reveals the formation of gold nanoparticles by showing surface plasmon absorption maxima at 500 nm.